If you are an opera fan, or if you like the voices Barbra Streisand, Celine Dion, Mariah Carey, and other more prominent singers, then you might be wondering how they are able to produce such beautiful melodies that normal people don’t. You may also be wondering about a certain someone who has to have his/her larynx removed because of unavoidable illness or injury. The larynx is usually called the voice box because it is where sound comes from. It is the one that manages the pitch and volume produced by mammals, and it is also the one that houses the vocal folds which is considered to be very essential in the composition of phonation. It is the most critical part of singing and human speech, and it is also very important for other biological functions. It is originally thought that the evolution of the larynx is the same as the process that caused the evolution of air-breathing animals. Our lungs are actually comprised by several very delicate tissues that should be confined in strict biological limits, like humidity, temperature and freedom from foreign and unknown particles. Along with the first-breathing animals is the evolution of the larynx, whose original function is to protect the lungs from all causes of diseases or disturbance. This function of the larynx of protecting the lungs remains the most important among the other functions of the larynx that it has achieved through subsequent evolutionary developments. Aside from the fact that the larynx is very important in the production of the human speech, it is also very important in other functions such as swallowing, vomiting, coughing, and in eliminating all irritants found in the abdomen. If you have seen an Adam’s apple, it is actually the protuberance of the front of the larynx. But how does the larynx work to provide us with sweet music? 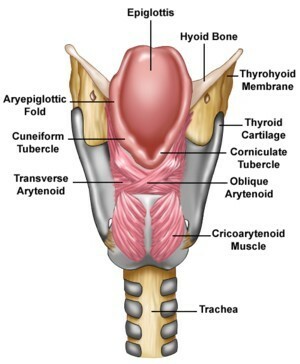 The inside of the larynx where speech and singing is produced is shaped like a cylinder. As the air ascends through the larynx, it encounters the vocal folds, which are actually two folds of tissues that extend in the right and left side of the larynx. This part of the larynx is called the ‘true’ vocal folds. These are attached to the inside thyroid cartilage that is in the same level as the Adam’s Apple. These same vocal folds are attached to the set of cartilages also known as the arytenoids cartilages. Once these cartilages contract, it can move the arytenoids and the posterior part of the vocal chords. The process of vocalization results from the air being blown up from the lungs and passes the edges of the vocal folds. This particular flow of air will initiate a repetitive cycle of the vibratory movements done by the movements of the vocal folds. This particular movement is also called excitation, and it used to term the sound produced from the explosive quality of the burst of air. When repeated at a high frequency, this subsequent burst of air takes on a tonal quality, which is what we call sounds or speech.